Good medicine, the best in the world........well at least I think it's the best........time with the people you love. Our friends Tom and Judy invited us to their little piece of paradise this evening for dinner. They live on the Warrior River, along with their dogs, cats, llamas and donkeys.......our friends Brenda, Danny and Deborah joined us. 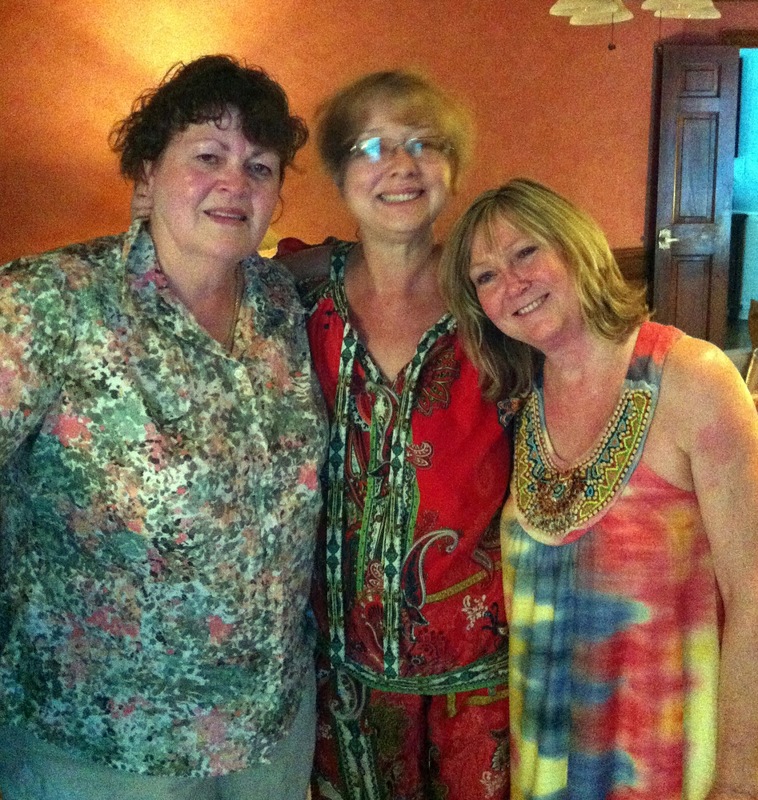 What is it about good food, and good friends? All of our friends are such incredible cooks, it just seems silly to meet a restaurant. We sat around their big round table, watched the sun set on the river, laughed, talked, ate.....did I say laugh? Every once in awhile, I would just look at all of them, and think to myself........this is heaven.......surrounded by friends who love you, sharing an incredible meal, a glass of wine.......this is wealth beyond measure. so many people that I meet every day are so empty, so sad. Would they believe me if I told them that a night like tonight creates wealth that is unimaginable, brings joy that is irreplaceable? Rick asked how I felt as we were driving home, I told him I felt good......that this time, this evening was good medicine, it was just what I needed, what I craved. I hated leaving my friends tonight, looking up at the moon wrapped in a haze, the heat of the night made the air heavy. The drive home, well, all we could do was talk about how good it was to see our friends......all I could think about was how good I felt. Good medicine indeed.......doctors should prescribe a night like this. I have always known the value of friends......my parents taught me that at an early age. Yes, we had family get togethers, but my parents spent time with their friends too. When my brother Ricky and I were in high school, and our folks took us to the beach, we took our friends with us too. Our parents vacationed with friends, family was important, but at our house, friends were too. Through the years, friends have been there for me, through the good and the bad. They have laughed with me and cried with me. Since my treatments started in February, friends have rallied round.....they will never know what their calls, texts,cards and emails have meant to me. I know that when someone says what do you need, what can we do, they mean it. I know that when someone calls or texts and asks how am I doing, they don't want a BS answer, they want the truth.......I struggle with an answer other than ok, but I realize that my friends really do want to know if I am having a bad or a good day. my friends have gone way past something.......that something makes the pity parties shorter, the tears dry quicker, and the smiles more often.......the I love yous, and hugs......well, they are immeasurable. And with all the kudos to friends, I can't shortchange my family........their calls, visits, notes, meals.......if I ever had any doubt of ever being loved......between family and friends......that doubt is gone forever. Dixie and Rebel( our neighbor's bulldogs) have brought their "sister" over to enjoy their morning treat of dog biscuits with the Watsons. Their "sister" is Tinkerbell and she is some sort of tiny three pound fur ball.....she appears to be a mini Yorkshire and loves her "big" brother and sister. I buy the BIG dog biscuits because four of our five canines weigh in around 90 pounds each. So each morning as Rick and I sit in our living room , sipping coffee, watching the birds, ALL the dogs get a biscuit. Tink decided to join the party yesterday, the biscuit is almost as long as she is, but she grabbed it and headed for home, as if she had made the score of a lifetime. This morning she was back for more. airedale mix, Lady has joined in also.......Rick says he has to go back to work to pay for dog biscuits. Lady comes right up to the door, after all this is her second home, Dixie and Rebel sit under the persimmon tree and wait patiently, and Tinkerbell waits under a huckleberry bush. Each of them politely walks up, takes a treat and finds a shady spot, except Tink.......once that treat is in her mouth, she runs down the hill, crosses the road and rests on her front porch. She is really fast! I am trying to get a video or photo of all of them, but they are rather camera shy.......and Tink is just too fast. Years ago, when Jordan's mom, Samantha was his age, we made home made biscuits for the dogs, I think that will be a great project for Jordan this week! Pics to come as soon as possible! A room full of angels dressed in blue, a "chair" buddy who is pure sunshine, and a doc who is smart, and kind and beautiful inside and out......and a hubby who never complains about the hours spent at the medical facility......these are the people I spent my the day with today. I don't even look at the drip anymore, not even when it beeps and they clear the air from the line. Those "blue angels" move so effortlessly across the room, from one big green chair to the next. They seem to know what you need before you can speak it, a warm blanket, water, a smile, kindness. They will never know, how much they are loved and appreciated, how many prayers are said for their happiness and well-being. My "chair-buddy", I worry so much about her, I know she is not eating, I know she is fighting for her life. she fights daily. She is loved, and being cared for......and if love can heal......she will be healed. Disease is scary, for everyone......I worry more for the people that love me, than I do for myself......and I know they worry about me. you hit the lottery when you got her for a doc. She is selfless, and funny and you want her to be your best friend.......and she wears really cool shoes! Treatment number five took place today, still no word on the culture (damn, it grows slow) blood work, and incredible sleep. I am starting to see the good in all of this, the blessings of friendships made in those green chairs, the reminder that life is so fragile, so short, knowing that sadness and depression are ok in small doses, and that hope and faith sustain most of us, most of the time. Tonight, I don't ask for myself, but please say a prayer for my "chair buddy" and those blue angels, and my doc......my world, the world itself, is a better place because of them. Often in yoga I talk about letting go of expectations......I know it is a difficult thing to do. I have a treatment tomorrow, lots of blood tests, and hopefully will know about the culture that was done a few weeks ago. The tests should show if the treatments are working, and if the culture shows what the docs think it will.....well, there is another bump in the road. rose, the air quality is not so good, and the breath is short. I really do understand how hard it is to let go of expectations, because mine have hung over my head like storm clouds the past week. Letting go of expectations.......it is so easy to expect isn't it? No expectations is a glorious place to be, and honestly, I am there most of the time. But this week, I have worn blinders and tried my best to disregard those expectations taunting me. Expectations can cover any and everything.......you help someone, where's the thank you?, you love someone, where's the love?, life throws a few curves, a few bumps in the road, where's the sympathy?. We are use to actions and reactions......letting go of expectations throws that theory out the door. Holding on to expectations can destroy our hope, our faith, our belief that all is well, our trust in goodness. So tonight, this blog serves as my reminder......let go of expectations. Listen to Michael Jordan, don't be afraid to fail, and don't be afraid to try again. What is it about humans that we have to relearn lessons over and over? I think that I get it......and the next thing I know......I am relearning some lesson I swore I would never have to learn again! For the past several months I have been aware of my energy level, and when the tank is empty don't push it. I had a great time yesterday, being with friends, listening to other singer/songwriters, but last night in the midst of one of the shows, I looked at Rick and said "we need to go home." I had pushed......past empty. So, yes, I relearned my lesson......hopefully it will last longer this time.......and yes actually, not being well today was worth yesterday.....the good news, in the past I would have ignored my body today and packed in as much as possible today also......I did not do that......lesson learned. A day of music......usually when I mention music, it's about one of our gigs.....Rick(my hubby) and I are singer/songwriters. Today, we gave ourselves a treat and a break......we visited venues and heard eight different singer/songwriters this afternoon and tonight. audience members talking loudly, forgetting lyrics or chords......stuff happens. The realness of live music......nothing like it. It has been a good day, filled with music, seeing friends. As much as I love being on stage, sitting in the audience helps too, a different perspective.......you see what works, what doesn't work, and you learn........and you get to hear creative people doing what they love. I am tired, very tired.......having fun is hard work. I hope you all have worked as hard as I did today! So, have you spent your life ignoring your genius? What is your genius? Why aren't you living it? and faith.......not easy........but a life of genius, a life of value.........that's the life we seek. Tomorrow, live like the genius you are. Albert would be proud. I learned this lesson the hard way. For years, I thought if a good opportunity came along, I should take it. It took some knocks and bruises to understand that was not a truth. Years ago, I was offered a great job......advertising director of a newspaper. I had worked in advertising and had actually worked at this particular paper( and had been fired from it, LONG story). When the job was offered, I jumped on it. Good pay, good job.........but not for me. I was miserable.....I didn't stay but a few months and when I left, I didn't look back. once again, "good" opportunity, but in less than a year I knew it was not good for me. This is the kind of stuff they don't teach in college, this is one you learn by living........because even if you hear me talk about it.......you will have to learn this on your own, I doubt that you would listen to me......but maybe you would. them? I'll never know the answer to that one.....and thinking what if.....well, that is just a waste of time and energy. "Good" opportunities.......think long and hard, be truthful to yourself, and remember that "good" doesn't mean it's good for you. hot and humid, as it should be in Alabama. On these transition days, solstice days if you will.......I imagine what it would be like without clocks or calendars. Would your body know instinctively that today was the first day of summer, that it would be the longest day of the year? Or would you be sitting patiently, wondering when the sun would set? First day of summer, when you're a kid in school, it's what you wait for all year. The chance to spend all day out doors, grasping that very last minute of daylight like a precious jewel. First day of summer, flowers are blooming, the garden is beginning its bounty, and the trees are lush, dazzling shades of green. I sit here in front of the window,with the lace curtain and I can here the birds sing. First day of summer, and the year is half gone......how can that be? What happened to all those other months? In the blink of an eye, leaves will turn, and the days will chill.....and before we know it......the shortest day of the year. First day of summer, thanks for the bounty.......fresh blueberries, and strawberries, and squash and tomatoes, peppers and potatoes, cucumbers and eggplant, big juicy melons. First day of summer.........enjoy it, in a few hours.......its gone. A couple of weeks ago we got baby chicks from the local co-op......they were so cute! All fuzzy and chirping. A few days after we got them, Rick remarked about how much they were eating, I looked at them and thought, is it possible they have grown that much? These "baby chicks" are huge! They eat more than any chicks we have ever had.......and they are no longer cute.......they are now in that weird, tween, ugly stage. I think they are going to be giant chickens,hopefully who lay big eggs. We use them as pest control, Japanese Beetles have invaded our garden, but no worry. Every day Rick hand picks the bugs off our plants, and they are given as treats to the "chicks". Maybe that is why our "chicks" are so big. We have never had chicks that ate corn from your hands but these do........this chicken venture has turn out pretty interesting. I can't wait to see what they look like as grown chickens! I will take photos tomorrow. Stay tuned for the giant "chicks"! There are a lot of dreamers and a lot of doers, but so many times they are separate entities. When the two become one, that is when change takes place. I have been a dreamer and a doer, but these days, I am becoming a dreamer who does........it makes for a much richer, happier life. When you put those legs on dreams, when you decide to not only dare to dream, but actually do something about it.......magic happens. Don't we all want some magic in our lives? I had been thinking of the beach all week.......I kept thinking that maybe I needed a break or that my lungs were craving the salty air. Today, I realized why all those memories of the beach had haunted me this week. It's Father's Day.......and my dad loved the beach. He loved to just walk in the sand, getting his feet wet.....or sitting in front of the little cinder block cottage where we always stayed. He said the salt air, and the sunshine was all he needed. He would look at the waves, listen to the gulls, and smile. He always seemed so full of peace there, so happy. He would have lived there, if my mom would have moved. He loved sharing the ocean/beach experience..... he would take our friends, and then later all the grandkids. It would have been nice to have spent the weekend at the beach, in remembrance of my dad. But, he also loved this little farm that we live on, and I believe that he would have felt the fresh air and sunshine here was pretty good today. that we lost contact, life happens you know. But, Kaye and Karen now live within a couple of miles of each other, and only about an hour and a half from me......tonight we and others had dinner, a swim in Kaye's pool and enjoyed a wonderful slide show of Kaye and Jamie's recent trip to Greece, Italy and Turkey. Good food, good friends.......this is the good life, and I am grateful. It has been a week of transitions at work.....students, coming and going. Both directions are difficult. Coming into rehab is a difficult task at best, new people, strange surroundings, structure, rules, and learning to open up, to share your feelings. As a yoga teacher, the coming can be stressful as well......many would never ever do yoga, but it is part of their treatment plan......so there is resentment, fear, and denial when they walk through my door. The going......is scary, exciting, dreaded by those leaving......for me, sadness and joy.......hoping that the breathing, meditation and yoga skills I have taught will be tools for recovery.......sadness......the goodbyes. Most who leave will never know or believe how much I think about them. How often I wonder if they are ok, if their lives are good, if they have developed and maintained a yoga practice. I remember very few names, (there have been so many I have taught) but often at night, I lie in bed and I see their faces......and pray that their lives are fulfilling and peaceful, that they are safe and healthy. We are always in some state of transition aren't we? It might be the job, relationships, but there is always transition and that is much better than stagnation. None of us could tolerate a life of stagnation, no matter how much we think we might want it. For me, as many of you know.....I am in a transition of health, hoping for the best......waiting to see where the path takes me next. in a funk. Same goes for being around those whose glass is always half empty, they exhaust me. Maybe it is the time in the green chair, or the chemicals that are in the drip......but my tolerance for gloom and doom and naysayers has gone with the wind. Spending a good chunk of my time at doctors' offices has made me desperate for the beauty, I crave it. I crave laughter, and hugs and good times. I find myself seeing beauty in the most mundane, the ordinary. be flaring up, my energy dropped. It was one of those days when I knew I had to practice what I taught. When I stopped looking at the ugly, and reminded myself of the beauty that was still around.......I felt better. We walked early this morning, on the trail where the kids picked blackberries yesterday......there were still big fat juicy berries waiting to be picked. Our normal walk took twice as long because Rick and I were stopping and eating berries. As we were walking through the field the dogs went crazy, a rabbit dashed across the field and before either of us could say anything, another rabbit ran in the opposite direction. All we could do was laugh at our confused dogs. Surrounded by beauty.....it was a great walk. I hope that your Friday brings you the opportunity to look at the beauty around you, and that when given the choice, you choose happy. It has been a zoo, a circus, a monkey house, and a trip to OZ at our house this evening. Jordan and my other great nephew, Stone, plus Stone's sisters, Daisy, Breeze and Joy have been here.......that's right, five children under the age of nine. They all came to pick blackberries, to run through the fields, gather flowers and eat hot dogs! I can't believe how much food five little kids can eat! A testament to how much fun they had.......none of them wanted to go home, there were a few tears shed. But with promises that they could all come back and spend the day next week(what was I thinking!!!) we finally got them home. Blackie Bear is lying here by my desk, I can almost him say.......send me to the vet's when they come back. Their energy is amazing, their love for each other is amazing.....the house was full of laughter, and now.......I think I can drag myself to bed. I dream about you. There is a strange comfort in the coolness of you against my skin. You have a commanding presence, you give me hope, but you also deepen my fears. You are not faithful, actually you are quite the whore, because so many have been held in your arms. There is as much love and life in you as there is death and sadness. You are god like.....confessions and vows have been made before you. You hold all the power, yet you have none. With you, those of us who are so different obtain a common ground. We come from all walks, yet you make us equals. I dread my time with you, yet I adore you. With you there is no past, or future.......you demand the now. You have increased my desire to live fully, to spend time only with those I care about, to sing until my breath is gone, to experience as much of this world's beauty as I possibly can, to write and create, to taste, to feel, to see, to love and be loved. Before I met you, I said these words often, "time has wings". Now I know the truth........the wings beat faster every day. Summer storms swept through our area this evening.......with seventy mile per hour winds. Our power just came back on.....it is still raining. Some summers are dry, some are like this one, hot, rainy and humid. It has been a long day, for every step I made forward, I took two backwards. It is time for Blackie Bear and I to find the sandman. Tomorrow is another day, isn't it? a friend's father passed away. Life has not been its brightest for many the past few days.....and when that happens it is easy to gaze into the darkness and forget that there is sunshine, and it is always shinning somewhere. to help me "get it". But this one does it brilliantly. Where ever you are tonight, whatever is taking place in your life, good or bad........remember to face the sun, leave the shadows behind. By the way, for those of you who send me your good thoughts and healing energies so often.......I had a good day today, my face has been bathed in sunlight, even in the pouring rain. It's summer in Alabama, the monsoons are hitting (well, a low out of the Gulf of Mexico) and flowers are blooming like there is no tomorrow. I love flowers......in the garden, on the porch, in the house. 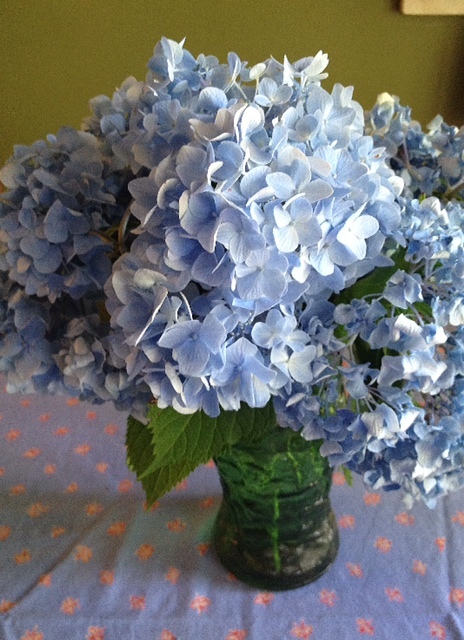 The brilliant blue hydrangeas came from my brother Ricky's house. Ricky and I inherited green thumbs, though he can grow roses and I cannot. Blue flowers are so unexpected aren't they? These are on the kitchen table, they make me smile, every time I look at them. Here's sending you all smiles tonight. I taught a class today on non-violence........and not the obvious. I actually taught non-violence toward ourselves. It is easy for most of us, to think of being non-violent toward others......humans and creatures. We don't think about the violence we do to ourselves. How many times have you called yourself dumb or stupid? How many times have you belittled yourself? Have you ever looked in the mirror with disgust? alcohol or demeaning behaviors? Have you "harmed" yourself with destructive relationships? Have you pushed yourself when you shouldn't? Disregarded warning signs concerning health, relationships or lifestyle? mat neighbor's. We often talk about kindness toward our fellow man, but the seeds of kindness, the seeds of non-violence began with us and our personal perceptions. Fatigue does not even begin to describe me tonight.......I have spent the day with Jordan (my four year old great nephew). He is wonderful, but we have done LOTS of stuff today. I had brought almost thirty yoga mats home from work last night to wash today, so we did that. We picked blueberries. We carried ice tea to Rick and Ray as they worked on the barn today. We sprayed each other with the water hose. We blew bubbles, we watched his favorite cartoon shows. We cooked lunch. It has been an eventful day and I am so tired my eyes are crossed. But I know he had fun, because he did not want to go home. It is a good tired. Even the dogs are tired. Blackie Bear looked at me this afternoon with his big sad eyes as if to say, when is this child going home? But I know in the twinkling of an eye, Jordan will be an adult and I want him to have good memories of us. I just wish I had his energy, I am so envious. So tonight, a hot bath, a cup of tea, and bed are calling my name. "We must raise ourselves to the levels of energy where we are the light we seek, where we are the happiness we desire,where we are the love we feel is missing, where we are the unlimited abundance we crave." I constantly teach my students that the answers we seek, are within us.....sometimes I forget that. The Power of Intention, by Dr. Dyer. When life is difficult, when it seems that the darkness is closing in, it is not easy to be our own light, but sometimes we must. On the days when happiness seems to be so elusive, and our lives fallow, and love seems to have turned its back, it does not seem possible to find it all within........but it is there, patiently waiting. It is so much easier to teach a lesson, than to learn it......but tonight, the teacher learned. A little good news tonight......this may not seem like much, I was tested for penicillin allergies today. All my life I thought that I was allergic, turns out I'm not. That is a big step forward toward my health and wellness. Thanks for letting me share. There was a flip side, the treatments may not be working.....we'll know in a few weeks......just another bump in the road. Wow, these are such powerful words.......I constantly hear people talk about how others should live, what they should do, how they should believe, what they should think.........selfishness abounds in our society right now. Letting go, letting be, encouraging others to live their own lives........you may think it is a loss of power, but it is really freeing, and extremely empowering. and cared for. But, we have to walk our own path, make our own mistakes......live our lives as we wish. what a selfish act it was. I have to admit.......I never thought myself selfish, but in this context.........I have had some pretty selfish moments. Some days the transformation information hits too close to home. kind. It was one of those wonderful friendships that lasted through time......a few years would go by and then we would see each other or he would call and all was good. He was a writer, and I wish like hell he had written a book. He was a wonderful photographer and a good man. His wit and humor were way beyond ordinary, and he treasured his friends and family. Cancer took him way too soon, before most of us even had a chance to say goodbye. His dad had asked Rick and I to sing Amazing Grace at the memorial service today........it's hard to sing when the tears want to flow......but, John loved our music......and for him today, we sang our hearts out. It is not fair, the loss of those who give so much to life and those around them. It is not fair, that the world is robbed of talent, of kindness and brains. It is not fair to lose a friend. I have never been to Paris, but I dream about it.......to walk the streets, to eat and drink, to feel the rain on my face. We watched the movie, Midnight in Paris tonight.......Paris in the twenties would be my place to visit back in time. To have been there and maybe been a part of that creative community, it is the stuff my dreams are made of. Zelda would probably have been highly perturbed that a Jilda was there, but hanging out with Hemingway and listening to Cole Porter would have been worth her barbs. Maybe smelling Evening in Paris on my mom when I was child planted the seed of Paris, but as the years went by I read books about Paris, watched movies, read Coco's biography more than once and dreamed about it. It's interesting, most of the famous places in Paris and France are not even the places that top my list........it is simply the everyday that I want to experience.......walking the streets, eating where the locals eat, driving through the French countryside, eating fresh bread, cheese, and drinking the wine, a little chocolate, a few flowers and maybe the Eiffel Tower at six in the morning. I loved the movie, it was a great escape and a beautiful story.......I will watch it again......and dream.